Under the patronage of H.H. Sheikh Hamdan Bin Rashid Al Maktoum, Deputy Ruler of Dubai, Minister of Finance & Industry, President of the Department of Health and Medical Services, the Dubai International Medical Care and Diagnostic Conference & Exhibition IMD Dubai 2005 was held from 10-12 September, 2005. The event took place in the Dubai International Exhibition Centre, Dubai – United Arab Emirates. 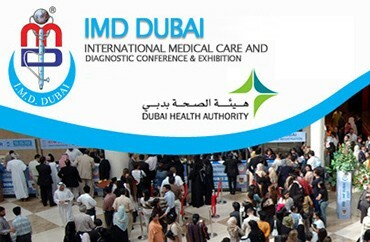 IMD Dubai 2005 was held in cooperation with the Department of Health & Medical Services, the International Hospital Federation, Charite University Berlin. The conference was supported by the Ministry of Health, Dubai Chamber of Commerce & Industry, Dubai Municipality, Ministry of Interior, Dubai Police General H.Q., Emirates Medical Association, Sheikh Hamdan Bin Rashid Al Maktoum Award for Medical Sciences – Centre for Arab Genomic Studies, Medica - Messe Dusseldorf.